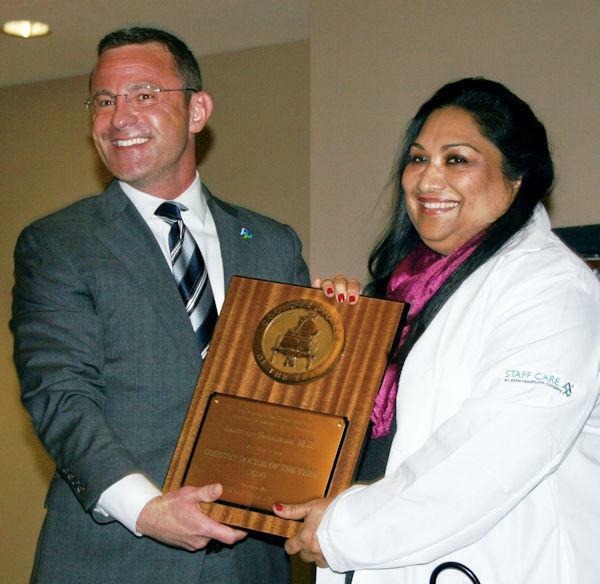 Board Certified Family Practitioner Dr. Jasmine Sulaiman is presented with the Country Doctor of the Year award by Staff Care, Inc., an AMN Healthcare Company. Congrats to Dr. Sulaiman, 2016 Country Doctor of the Year, LIVINGSTON, April 14, 2016 - CHI St. Luke’s Health Memorial Livingston wishes to congratulate Jasmine Sulaiman, M.D., FAAFP, of Cleveland, for being named Staff Care's 2016 Country Doctor of the Year. Board certified family practitioner Dr. Jasmine Sulaiman has extensive experience in primary care, emergency medicine, and medical teaching, but it’s her commitment to her patients and providing a health care safety net for rural, southeast Texas that sets her apart. For the past ten years, she has served as the sole physician at four federally qualified community health centers throughout a three-county rural service area. Statistics indicate 1,000 rural communities lose a doctor each year and those physicians are replaced at a 700:1 ratio. Three percent or less of the current medical school graduates considers working in a rural area with a population of 30,000 or less. In addition to seeing patients and making house calls, Dr. Sulaiman serves as the medical director for the four clinics that make up Health Center of Southeast Texas, a Federally Qualified Health Centers (FQHCs). Over 70% of the center’s patients have no health insurance, while over 30% of its service population never completed high school. She implemented a program that upgraded medical care at the county jail and spearheaded the effort that saw the Health Center of Southeast Texas designated as a Level 2 Patient Centered Medical Home. She plays a major role in providing medical care to the uninsured and underinsured population, and educates and supervises multiple midlevel practitioners. Due to an urgent need for mental health services in the area, Dr. Sulaiman is helping to implement a tele-psychiatry program at the center. "Dr. Sulaiman brought humanity to medicine," said friend and colleague C. Kuruvilla Mani, M.D., F.A.C.C. Dr. Sulaiman has served as medical director for Health Center of Southeast Texas since 2006 – interviewing for the position in the aftermath of Hurricane Rita. She completed her residency at Columbia University in 1999 where she was the chief resident. She completed a post graduate training in Health Leadership and in Faculty Development from The University of North Carolina. Dr. Sulaiman was the Texas Family Physician of the Year in 2013-2014. She is a member of The American Academy of Family Physicians, the Texas Academy of Family Physicians, World Organization of Family Physicians and the Texas Medical Association. "Dr. Sulaiman had many choices and yet she chose Cleveland,” Cleveland Mayor Niki Coates said. “Her patients are the luckiest in the nation. She is the star of Cleveland, and right now she makes us all look good." Dr. Sulaiman sees patients in Livingston, Cleveland and Shepherd and Liberty. As the 2016 Country Doctor of the Year, Dr. Sulaiman will be able to enjoy two weeks of time off, as Staff Care will provide a temporary physician to fill in for her at no charge, a service valued at approximately $10,000. On April 8 at a ceremony in her honor, she received the award’s signature plaque featuring a country doctor making his rounds on a horse and buggy, an engraved stethoscope, and a monogrammed lab coat. Click here to visit CHI St. Luke's Livingston online!